The Bermuda Chromed stand has polished finish and a high end feel. Designed for commercial life style and is made to be very durable. Held in stock for a fast and free mainland UK delivery service. 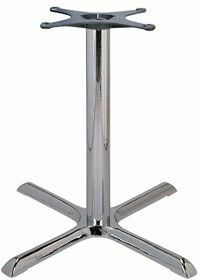 Beautifully manufactured table base, constructed from chrome with a wide four legged base and sturdy column. Delivered from stock with a lead time of 3-5 working days from date of order.